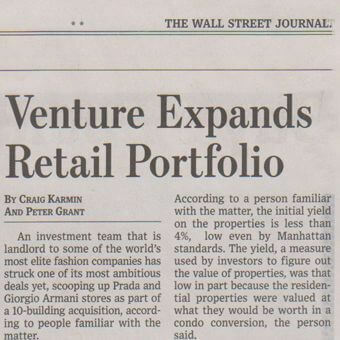 An investment team that is landlord to some of the world's most elite fashion companies has struck one of its most ambitious deals yet, scooping up Prada and Giorgio Armani stores as part of a 10-building acquisition, according to people familiar with the matter. The building that houses the Prada store on Fifth Avenue was part of the deal. The venture led by SL Green Realty Corp. and investor Jeff Sutton has agreed to pay more than $400 million for the portfolio that includes scores of Upper East Side apartments as well as the buildings that house the Prada store at 724 Fifth Ave. and the Armani store at 760 Madison Ave. Another participant in the buying group, Stonehenge Partners, is looking to convert the rental apartments in two buildings to condominiums, a person familiar with the matter said. The seller was David Frankel Realty, a family-owned real estate company founded in 1938. Representatives of SL Green, Mr. Sutton, Stonehenge and David Frankel declined to comment or couldn't be reached to comment. The deal, which hasn't yet closed, is the latest example of investors paying top dollar for high fashion sites. Other transactions in the past two years include Thor Equities' purchase of the Takashimaya building on Fifth Avenue and the sale of the retail space in 666 Fifth Ave. to Inditex Group of Spain, for a Zara location. The SL Green group is paying a steep price for the portfolio. According to a person familiar with the matter, the initial yield on the properties is less than 4%, low even by Manhattan standards. The yield, a measure used by investors to figure out the value of properties, was that low in part because the residential properties were valued at what they would be worth in a condo conversion, the person said. The value of the Giorgio Armani building also is limited because it's actually on a long-term land lease that is expiring soon, according to the person familiar with the matter. If the SL Green group isn't able to renegotiate an extension of the lease with the owner of the ground at that time, it stands to lose control. SL Green is best known as the largest owner of Manhattan office buildings. But with Mr. Sutton, the company also has amassed a growing number of premier Manhattan retail addresses. SL Green provides the bulk of the money for the partnership, while Mr. Sutton lines up the tenants, say people familiar with the matter. Mr. Sutton is a former retail broker whose early clients included Payless shoes. With the Prada and Giorgio Armani buildings, Mr. Sutton and SL Green are expanding a retail empire that includes locations for Valentino, Dolce & Gabbana and Escada in the same tony Manhattan neighborhood. They are also landlords for American Girl Place on Fifth and American Eagle Outfitters near Times Square.